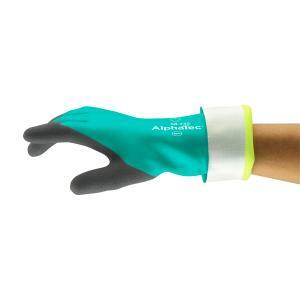 The Ansell AlphaTec 58-735 Chemical and Cut Protection glove has medium duty nitrile chemical protection, protects workers from select chemical risks and long-lasting snag, puncture, and abrasion resistance. INTERCEPT Cut Resistance Technology, provides great level of cut protection along with great comfort while maintaining high dexterity and ease of donning and removal of the glove. ANSELL GRIP Technology, allows for less force and optimal control and confidence when gripping in oily or wet environments, further reducing hand fatigue and enhancing worker comfort.